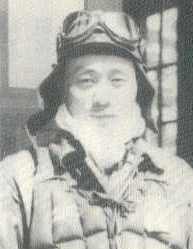 Sometime between 1230 and 1430 on April 6, 1945, Ensign Masanori Ueno took off from Kokubu No. 2 Air Base as pilot in a Type 99 Carrier Dive Bomber (Allied code name of Val) carrying a 250-kg bomb and died in a special (suicide) attack off Okinawa at the age of 24. He was a member of the Kamikaze Special Attack Corps 1st Hachiman Gokō  Squadron from Usa Air Group. Ueno was from Kagoshima Prefecture and attended Senshū University in Tōkyō to study economics. He entered the Navy in December 1943 as a member of the 14th Class of the Navy's Flight Reserve Students (Hikō Yobi Gakusei). In March 1944, he began flight training at Tsuchiura Air Base in Ibaraki Prefecture. In June 1944, he transferred to Izumi Naval Air Group in Kagoshima Prefecture. In September 1944, he transferred to Usa Naval Air Group in Ōita Prefecture. Thank you. Because of everyone, now I can stand on my own. Tomorrow morning my squadron will make a sortie. I pray that you, along with the Empire of Japan, always will have good fortune. Here is guidance to all my younger sisters. I will sacrifice myself for the country. Sisters, get along well with each other. Show filial piety. Live properly as Japanese women. The letter comes from Kaigun Hikō Yobi Gakusei Dai 14 Ki Kai (1995, 17-8). The biographical information in the first paragraph comes from Iwamoto and Mukaida (1992, 109-10), Kaigun Hikō Yobi Gakusei Dai 14 Ki Kai (1995, 17) and Osuo (2005, 215). 1. Hachiman is the Japanese god of military power. Usa City in Ōita Prefecture has the first Hachiman Shrine, which was established in the early 8th century. Gokō means "protecting the Emperor" in Japanese. Kaigun Hikō Yobi Gakusei Dai 14 Ki Kai (Navy Flight Reserve Students 14th Class Association), ed. 1995. Zoku • Ā dōki no sakura (Continuation • Ah, cherry blossoms of same class). Tōkyō: Kōjinsha.